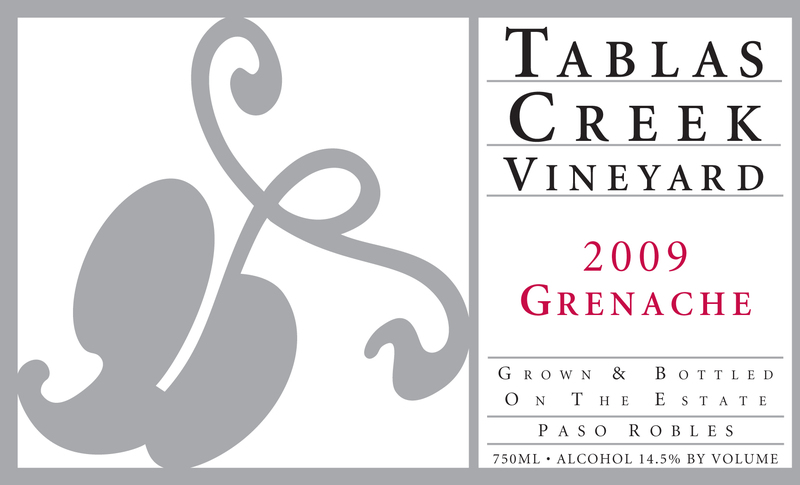 The 2009 Grenache is Tablas Creek’s fourth varietal bottling of the signature grape of the southern Rhone Valley. The wine shows the bright fruit and tangy acidity of the Grenache Noir grape, as well as the characteristic concentration of the 2009 vintage. The 2009 Grenache shows a powerfully Grenache nose of cherry liqueur, licorice root, and cocoa, but held in check with an appealing mineral note. In the mouth it shows rich at first, with rare meat and wild strawberry, then big tannins come to the fore. The tannins resolve in the finish and leave a suggestion of clean minerality. Pair now with substantial food, or age for a decade or more for a more elegant profile. The grapes for our 2009 Grenache were grown on our 120-acre certified organic estate vineyard. The 2009 vintage was our third consecutive drought year, with yields further reduced by April frosts. Berries and clusters were small, with excellent concentration. Ripening over the summer was gradual and our harvest largely complete at the time of a major rainstorm on October 13th. Crop sizes were 15% smaller than 2008 and 30% lower than usual. The low yields and gradual ripening resulted in wines with an appealing lushness, rich texture and wonderful chalky tannins. Grenache lots were harvested between September 26th and October 3rd. The Grenache grapes were destemmed and then fermented using native yeasts in closed stainless steel tanks. After two weeks, they were pressed and moved to neutral barrels to complete their fermentation. The Grenache lots were blended in June of 2010, aged for an additional year in a 1200-gallon foudre and bottled in May 2011.